Mayor Mike Ochs said all of the city’s government buildings will soon be on the map, and off the grid, when it comes the city’s power usage. The police station, airport, fire department, sewer plant, parks and city hall will be generated during the day on solar power. The city’s 579 street lights will be switched as well. 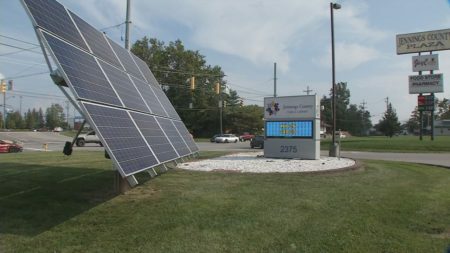 “We’ll go down to zero usage of electricity during the day, and at night we don’t use anything anyway,” said Ochs, who believes this is the first time a city in Indiana has made such a drastic change. Click here to read more. This entry was posted in Nebraska / Midwest News, NewsBlog and tagged Denver Housing Authority's community solar project, Illinois Tech's microgrid clusters, Nebraskans for Solar, North Vernon in Indiana, renewable energy news, states' leadership on clean energy development on September 21, 2017 by Helen Deffenbacher.